A common action for an event is to send it to one of the supported logging systems. This covers the Accounting requirement of the AAA (Authentication, Authorization, and Accounting) security design framework. For information on covering the Authentication process, check the authentication section and for the Authorization process, see the authorization section. In addition, arbitrary actions can be attached to an event by configuring event handlers. Event handlers are asynchronous / independent components and server operations will continue regardless of the side effects produced by the event handler. All data used by the event handlers is Unicode, encoded as UTF-8. The integrated logging system, keeps an audit trail for each action/event produced while performing management tasks or file transfer operations. The server can also send events to a SysLog server or to the Windows EventLog, but after an entry is sent, the server cannot retrieve or manage those logs. SFTPPlus does not use any form of logging level or severity level conventions to classify and categorize the generated log entries. Instead, the event groups are provided as a way to classify the entries. A single event can belong to multiple groups. A special group is the failure group, which contains all events which may be considered an error. A failure event is emitted when a client-side or server-side request produces an outcome that is either an error (when request is processed and returns an error as defined in the protocol) or a failure (when the request was not processed). For example, a client which requested to create a folder that already exists may be ignored since the client may also ignore the error. In other cases, you may want to investigate the failure and update the client to not try to create a folder which already exists. Internal server errors and errors which should not occur during normal operations are part of the failure and failure-critical groups. All critical failures have a details data field which contains information about the cause of the error. Configuration errors and other errors which cause one of the components to stop, or prevent it from starting, are part of the failure and failure-high group. 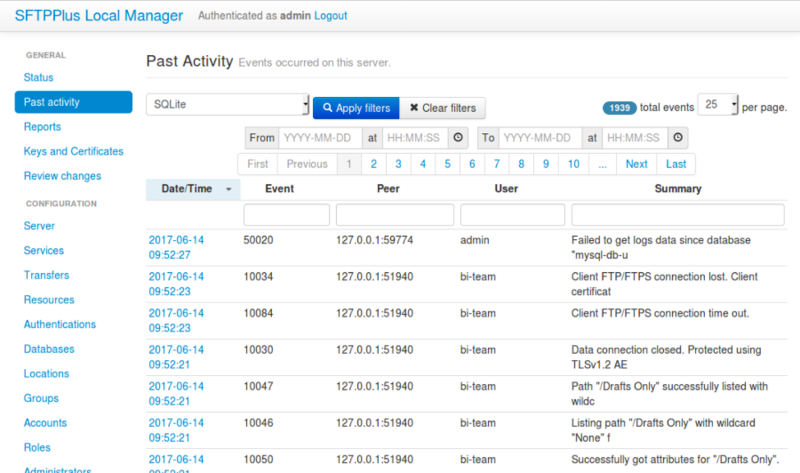 For low volume installations, the “Past activity” (or the audit trail) can be used within the Local Manager to view and filter logs. Using a web browser you can perform interactive searches withing the events generated in the past. Further view the details of each event. Please see below for an example page filtered by database (SQLite). Note that the embedded database, used by default by the Local Manager, is not suitable for high volume installations. Activities of accounts set up in SFTPPlus are reported in Local Manager. This section describes how the audit trail works in order to help you use it and integrate it as per your requirements. For configuring the audit system, please see event handlers configuration. Structured log data as JSON. While the plain text log format does not list the structured log data, this is available in the format used for storing audit entries in a database. 20076 2014-06-07 19:44:05 ftp-only-1 Process 0.0.0.0:0 Service “ftp” started on “0.0.0.0:10023” using “ftp” protocol. 10033 2014-06-07 19:44:10 ftp-only-1 Unknown 127.0.0.1:51290 New FTP/FTPS client connection made. 20009 2014-06-07 19:44:10 ftp-only-1 test_user 127.0.0.1:51290 User authenticated as application account using password credentials. 10059 2014-06-07 19:44:10 ftp-only-1 test_user 127.0.0.1:51290 User successfully logged on “/srv/iop_files/test_user” as “/”. 10061 2014-06-07 19:44:17 ftp-only-1 test_user 127.0.0.1:51292 Passive transfer requested. 10022 2014-06-07 19:44:17 ftp-only-1 test_user 127.0.0.1:51292 Listening on port 9000 for the next passive request. 10077 2014-06-07 19:44:17 ftp-only-1 test_user 127.0.0.1:51292 Processing STOR command for file “/remote_put”. <30>Apr 19 18:08:11 host test-server-name: 20156 admin 127.0.0.1:33674 Successfully started event handler “SQLite Event Handler” of type database. <30>Apr 19 18:09:53 host test-server-name: 20156 admin 127.0.0.1:33674 Successfully started event handler “sample-digital-signature” of type digital-signature-validation. <30>Apr 19 18:19:28 host test-server-name: 50002 admin 127.0.0.1:33674 Configuration read from local manager. <30>Apr 19 21:38:34 host test-server-name: 20156 Process 0.0.0.0:0 Successfully started database connector “SQLite” of type sqlite. Plain text log files can automatically rotate based on size, date or time of the day. Older files can be automatically removed, based on configurable rules. This helps limit the size of a single file and control the total disk space used by the plain text logging system. Audit entries stored in a database can be viewed and filtered using the Local Manager service. Currently, there is no option to remove/clean log entries stored in a database from within SFTPPlus. You can, however, use external tools to remove logs stored in a database. When an event handler is defined there are a set of rules based on which you can include or exclude the events handled by the configured event handler. Multiple rules can be defined and an event is handled if all rules are matching the targeted event. That is, the combined rules are defining a logical conjunction (AND). Note that inside a single rule the configured values can form a disjunction (OR), this is based on the characteristics of each rule. description: Sends logs to backup Syslog server. In this case, only events by the accounts (mcr_adm OR acct_aut) AND event IDs ( 20156 OR 20127 OR 50002 ) are sent to the specified Syslog path. Any other event IDs outside of this will not be logged. For more details check the configuration documentation available for each of the filtering rules. A simple and straight forward rule is to include only event IDs. The target configuration option also support event exclusion by prefixing the event ID with with the exclamation mark ( ! ). description: Sends filtered logs to Syslog server. Most of the events emitted by the server-side components will have associated accounts or usernames. These are part of the authenticated group and are emitted for a session for which the authentication process was successful. You can filter these type of events based on the associated user or account name. Note that the filtering is done based on the name, and not the UUID. This is done to accommodate various authentication methods which do not have the concept of UUID. description: Sends notification to Syslog server. SFTPPlus is built around a modular design in which multiple components are interacting in order to perform the manged file transfer flow. Components are file transfer services, authentication methods, transfers, resources and event handlers. Each component has an unique ID (UUID) and the handler can filter events based on these IDs. By using the UUID, you can rename a component without having to update the configuration of the associated event handlers. description: Sends rogue auth requests to Syslog. You can include or exclude events based on the source IP address of the remote peer. If for example, your load balancers are sending probes usiing the 172.26.2.45 and 196.168.9.34 IP addresses you might want to exclude those connections from the main logs. description: Sends all connections to Syslog excepting the probes. Each event emitted by SFTPPlus has a data attribute with an arbitrary structure. The members of the data attribute are specific to each event. This filter is usually used together with the target option, to also filter based on event IDs. If an event does not have the required data member, the event will not be handled. description: Sends PDF file operations to Syslog. To read more about HTTP POST event handlers in the audit trail, please go to the Developer Documentation. All fields that are displayed in the Past Activity page have an associated, single column, index. The sole exception is the Summary / message field, in order to limit database/table size. When using the database event handler, SFTPPlus will store / update the newly generated events in the database. As each installation will have its own data and log retention policy, SFTPPlus will not delete any event. This can result in a database which will continuously grow in size. We assume that each site administrator will use standard database tools to manage the size of the database.